Considering many of my real estate clients are wealthy luxury real estate buyers, many of them need my help in finding the best option for keeping and maintaining their boat or yacht after purchasing a property from me or my team. The Charleston South Carolina area is without question one of America’s biggest and most popular boating, and fishing towns, especially on the east coast. With the popularity of the Charleston SC region more and more people are moving here each year who love a life on the water. So it comes as no surprise boat storage both wet slip and dry stack is a hot commodity. Being of the most experienced boat slip Realtors in Charleston SC I have listed the boat slip marinas with wet slip “dock-0minum” in the entire area where one can purchase a boat slip. Some things to keep in mind when buying a boat slip in Charleston South Carolina: South Carolina has a luxury tax that applies to yachts and the tax bill is hefty IF and ONLY IF they are here in the state for 180 days or more. So, many large vessel owners move them to places like Florida, which has no property tax on boats. The quandary that’s in play in the yachting world is that taxes are due only on boats registered out-of-state if they spend a certain amount of time in state waters. Statewide the limit is 60 consecutive days or 90 days total, but counties can extend that limit to 180 days, as Charleston County and other coastal counties have done. Boat and marina owners say that even the extended, 180-day limit is too short, and prompts yacht owners to ship out rather than staying and spending money here. State law dictates that most boats are taxed on 10.5 percent of their value, as opposed to 6 percent for cars and 4 percent for owner-occupied homes. There is a $320 a month regime fee to own a boat slip here, and there is also a yearly POA fee due at closing (1/2 of 1% of purchase price) and yearly POA fee because the marina is part of Wild Dunes resort. Live aboard is not allowed here. Because the marina is located in a cove, the current here is very minimal and the depth at low tide is approximately 12 ft. Rated 4 stars by ActiveCaptains this marina doesn’t have slips come up for sale often, and when they do they sell very fast due to the demand. Offers a great restaurant, shop and boat ramp with ample parking. Amenities here: fresh water, 50 AMP electricity, cable TV access, and trash/recycling. Located just before you get on Sullivan’s Island off the intracoastal waterway in Marsh Harbor Toler’s Cove marina is a great option for those who live on Sullivan’s Island or The Old Village. Dues to own a slip here are $368 per quarter. Live aboard is allowed here and has a 4 star rating by ActiveCaptain. Low water depth is 8 ft so draft is a consideration for larger vessels depending on the location of the slip. One of the best things about this marina is the lack of current, because it’s located in a tucked away cove there is almost no current so getting in and out of your slip/marina is easy. Located at 33 Lockwood Dr along the Ashley river this marina is one of (if not the) largest city marina in Charleston SC where most of the largest yachts are kept. The dues a $600+/- per quarter for the 50+ ft slips. The smaller slips are closer to $400. It is also next to the Charleston city marina where celebrities and other famous yachts come when visiting Charleston. This marina does not allow live aboard, and has a very strong current because it’s on the Ashley River. It’s largest appeal is the location of being right in downtown Charleston. The negatives are that there is a 55 ft fixed bridge, and the strong current. Rated 4 stars by ActiveCaptain this marina has a low water depth of approximately 15 ft depending on location of the slip. Coming from offshore or the ICW, you must pass under the 56′ bridge in order to access the Ashley Marina. Amenities include: 50 Amp Electricity & fresh water, Basic cable & Wi-Fi included in HOA fee. If you want to know more about this marina here is their official owners page http://www.myashleymarina.com/. Located off the Ashley river in a cove the owners dues are $798 per quarter. This marina also offers dry stack options for boat storage as well. ActiveCaptains has a 4 star rating but the best thing about this marina is that is too (like Toler’s Cove) is located in a cove and therefore the current is very low. The negative is it has a fairly shallow low tide depth. Short term live aboard allowed. Located right next to the aquarium and Dockside condos, the marina at Lauren’s St are conveniently located for those who own a condo at Dockside or Lauren’s Place Condos. The regime dues are $1875 per year. The smallest of “marinas”, these are very limited and go quickly when someone sells. There are only 20 total slips with most of them having a lift and boat size is limited. 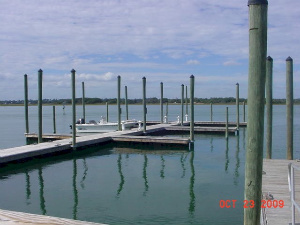 The largest marina near Folly Beach and only the Folly River these slips are probably the most affordable in price and in regime fee. Just outside of the marina are the Mariners Cay condos. Slips for sale in Sunset Marina have a quarterly regime fee of $360 . ActiveCaptains has a rating of 3.5 stars for this marina. Because it’s located off the Stono River the current is fairly strong. This is a smaller less popular marina. The ingress & egress (or how easy it is to get in and out of the slip). This is probably the most important factor when looking at purchase from a resale ROI perspective. The higher priced slips usually are because sellers know their slip has a much easier time for boaters to get in and out of their slip than what might also be for sale. Water flow – This is important because mussels and other ocean going animals (filter feeders specifically), will naturally gravitate to bodies of water; such as rivers where the water flows faster, and more frequently. As you’ll have to take the cost of cleaning the underside of the boat and engine at least once a year (unless there is a lift) into consideration otherwise you’ll have excessive growth. Whereas, marinas in a cove for instance tend to attract much less growth. Accretion – If the boat slip is located in a body of water where sediment comes and goes then one might have to be concerned with the draft (space under the boat) being a concern. Many Charleston SC marinas have to do regular dredging to keep this from happening and this may be a cost factor in the regime fees or assessments. Age of Marina – When you have to pay monthly or quarterly regime fees, these are to pay for the insurances, and upkeep costs of the marina you share with other owners. So if the marina, and it’s assets are older they may be in need of replacement & repair and subject to special assessment to cover that cost, especially if there is not enough money in the capital. This applies to all POAs, condos, townhouses etc (hence why they are sometimes referred to as “dockaminiums”). Water Depth – I know, this one is obvious, but in tidal areas it is extremely important that you make sure you know the draft of your boat as well as the slip’s location as it pertains to tidal behaviors of where your slip is because there can be really large tide swings.